Actus plugtop power supplies have a power range from 1 Watt up to 40 Watts and are designed for a diverse range of domestic and commercial electrical purposes. Applications include audio and visual equipment, broadcasting, security systems, IT equipment, telecommunications, retail and POS devices and digital photography. We also offer a range of Medical approved power supplies. Fully approved and compliant to Level VI. Actus plug top power supplies are Switched Mode and offer AC/DC mains power, single fixed voltage outputs from 3.3V to 48V. Other features include over voltage, over load and short circuit protection, auto recovery protection and durable casing. Interchangeable Pin versions also available. We offer a wide range of desktop power supplies (also referred to as inline power supplies) which includes power ratings from 5 Watts up to 300 Watts of power. 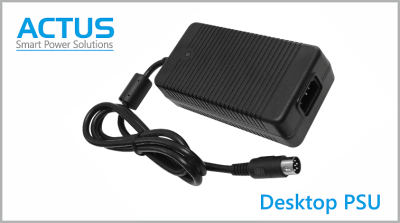 Our desktop power supplies are constant voltage single output, starting from 3vdc up to 48vdc. We offer both C14 and C8 input sockets. All our solutions are fully approved and compliant to Level VI. 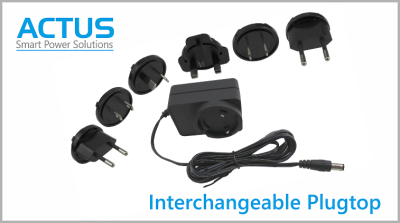 Interchangeable AC pin power supplies from Actus are supplied with a set of AC pins which can be changed depending on where they are used. One international power supply can be included in the box with your equipment and shipped globally without the need for the end customer to have to worry about finding a suitable mains lead. The units are universal input voltage so can be used globally. We offer international power supply ranges with power ratings from 6W to 40W and output voltages available from 3vdc to 48vdc. 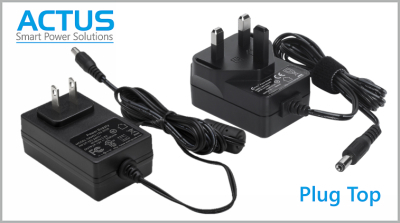 All of the international travel type power supplies from Actus are safety approved, and Level VI compliant. We offer a range of enclosed power supplies in a wide range of power ratings, typically from 15 Watts up to 1000 Watts, with an output voltage range from 3.3Vdc to 48Vdc. Models are available as single, dual, triple or quad outputs and are ideal for most industrial applications. We also offer a range of mounting brackets and all units are safety approved and come with a 3 year warranty. 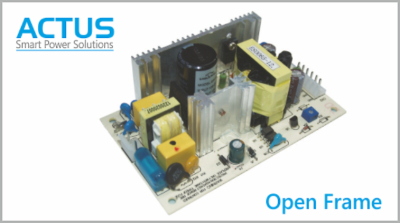 Open frame power supplies from Actus include single, dual, triple and quad outputs, starting as low as 20Watts through to 125Watts. Our products offer very high reliability and come with a wide Operating Temperature. They are suitable for applications including factory automation, telecommunications, networking, medical, test and measurement, POS systems and general electronics. We can also offer custom units to suit your applications. 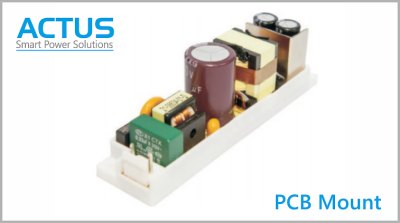 Our DC to DC Converters are available as PCB mounted through hole and SMD units. Available as Surface Mount from 1Watt to 15watts and Through Hole from 0.25Watts to 600watts. We offer both Unregulated and Regulated units. DC to DC converters are also available as open frame or enclosed units. PCB mount AC to DC converters offer a major advantage over chassis mounting AC DC converters, in that they can be mounted on the same PCB as the electronics they are powering. We offer a range of PCB mount AC DC converters from 3W to 40W, with output voltages available from 3 to 24Vdc and a number of dual output devices. In addition to the wide range of fully encapsulated PCB mount AC DC converters, we can also provide open frame versions on request. 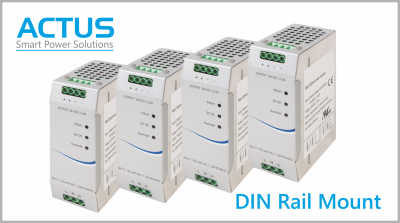 Din rail power supplies from Actus. To satisfy the broad range of industrial equipment process control and building automation applications we offer standard AC-DC DIN Rail power supply ranges from 30Watts to 960Watts. All of our din rail power supplies are safety approved. All of our DIN Rail power supply products are designed to be installed on DIN rail TS35/7.5 or 15 and are available with built-in PFC. We can supply a wide range of single or multi port USB output chargers including Plug and Desktop version and also offer various colours and plug types for UK, Europe, US and many other countries. Our USB output power supplies feature SMART CHIP technology and a Typical 4 way unit offers 24.5W output power, input, over current and short circuit protection. 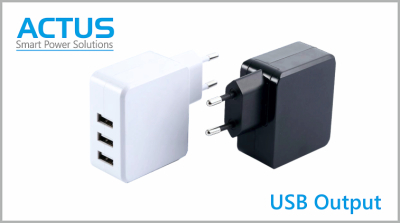 Our USB chargers are RoHS compliant and carry international safety approvals including Ul(CUL 60950-1 2nd Edition, CE-EMC-CE-LVD and FCC. 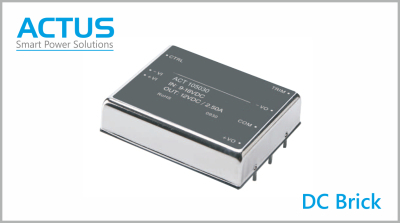 LED Drivers from Actus for both indoor and outdoor installations, to suit your requirements. 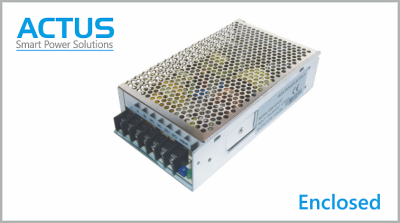 LED drivers offer some of the same features as a standard power supply, such as power factor correction, high efficiency, compact size and isolated or non-isolated design, but they have their own unique advantages too. We offer Constant Current, Constant Voltage, and Dimmable drivers. 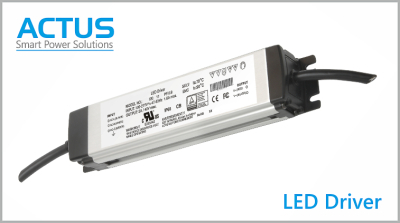 LED Drivers are designed to maximise both efficiency and reliability in your application so your LEDs will provide you with optimal performance. In addition to our standard range of transformers which includes Toroidal transformers and inductors plus EI transformers from 5VA to 1000VA. 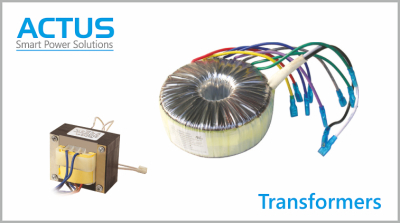 Actus offer a custom transformer service taking your design ideas to produce the optimum transformer for your application which could include a fuse or temperature switch for complete product safety. Our transformers and inductors are widely used in industrial control areas and in electrical cabinets or as step down transformers, voltage regulators, filter inductors etc.